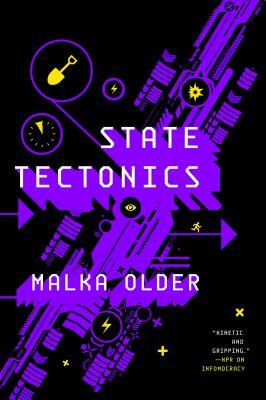 Campbell Award finalist Malka Older's State Tectonics concludes The Centenal Cycle, the cyberpunk poltical thriller series that began with Infomocracy and is a finalist for the Hugo Award for Best Series. The last time Information held an election, a global network outage, two counts of sabotage by major world governments, and a devastating earthquake almost shook micro-democracy apart. Five years later, it's time to vote again, and the system that has ensured global peace for 25 years is more vulnerable than ever. Unknown enemies are attacking Information's network infrastructure. Spies, former superpowers, and revolutionaries sharpen their knives in the shadows. And Information's best agents question whether the data monopoly they've served all their lives is worth saving, or whether it's time to burn the world down and start anew. MALKA OLDER is a writer, humanitarian worker, and PhD candidate at the Centre de Sociologie des Organisations studying governance and disasters. Named Senior Fellow for Technology and Risk at the Carnegie Council for Ethics in International Affairs for 2015, she has more than eight years of experience in humanitarian aid and development, and has responded to complex emergencies and natural disasters in Uganda, Darfur, Indonesia, Japan, and Mali. Infomocracy is her first novel.